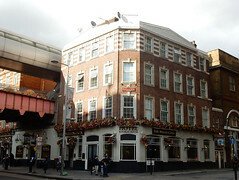 A large pub and hotel opposite Waterloo Station on the main road, near Waterloo East Station. Previously owned by the Marston's pub chain, it was acquired by Fuller's in November 2011. Unsurprisingly, given its size and location, this pub is always reliably packed; but it offers plenty of space filled with tables. The bar is split into two halves, though the seating space has been largely opened up, with entrance doors on either side of where the train lines and pedestrian link to Waterloo East bisect the building. It's a high-ceilinged space, with a varnished hardwood floor, chandelier-style lighting, and a stained-glass feature piece above the bar. Plenty of room is left free for vertical drinking. The walls are accented with exposed brickwork, wooden panelling, and large ornately framed mirrors. The bar has four handpulls for ale, which on our September 2015 visit offered London Pride, Seafarers, ESB, and Oliver's Island (the latter being a new Fuller's ale launched in March 2015). On a Wednesday evening in September 2015 it was already fairly full around 5pm, with only a few free tables. Music was playing, initially not too loud and almost inaudible over the many conversations going on. However, they started turning up the music around 5:30pm and it got quite hard to hear anything; by 6pm it was almost impossible to follow a conversation. On a previous visit in August 2009, the place was still lively and animated even near to closing time (11pm) on a Tuesday evening. According to the Wellington website as of September 2015, food is served 10am-10pm Mon-Fri and noon-10pm Sat-Sun. photo of main menu in the same month. Kake tried the onion rings (£3) photo in September 2015; they were disappointing, with very little onion content and very little flavour. There's free WiFi which requires registration, though there seems not to be any validation of the information you provide. Accessibility: A largish step to get in. Once you're in, there's no steps to the ladies' and the cubicle doors open outwards. Last visited by Kake, September 2015. Opening hours taken from the Wellington website, September 2015. Last edited 2016-07-05 19:02:36 (version 10; diff). List all versions. Page last edited 2016-07-05 19:02:36 (version 10).